A permanent, year-round resident, the Barred Owl was an uncommon species during the Minnesota Breeding Bird Atlas (MNBBA). Largely a species of the Eastern Deciduous Forest (stretching into western Canada and the Pacific Northwest), the Barred Owl is sparsely distributed throughout its breeding range (Figure 1). Non-migratory; winter influxes of northern birds may be related to prey availability. Carnivorous, feeding primarily on small mammals, small birds, reptiles, amphibians, and invertebrates. Hunts from an elevated perch. Secondary cavity nester that primarily uses natural cavities or the hollowed-out tops of tree snags; also nests in old platform nests built by hawks and crows or squirrel nests. Breeding distribution and relative abundance of the Barred Owl in North America based on the federal Breeding Bird Survey from 2011 to 2015 (Sauer et al. 2017). The Barred Owl has long been recognized as a common, year-round resident of Minnesota’s forested regions. Roberts (1932) wrote that its preferred habitat was the “deep, dark forests, though it may occasionally be found in more open places and even in the sparse groves of timber bordering the prairie streams and lakes.” Confirmed nesting records (nests with eggs or young), however, were sparse for such a wide-ranging species and limited to four counties in southeastern Minnesota: Hennepin, Houston, Scott, and Wabasha. Green and Janssen (1975) had little to add when they provided an update on the species’ status many years later. There were breeding records from the forested regions of the state, but no Barred Owls had been documented nesting further west despite their occasional presence. Janssen’s 1987 update included a map that defined the species’ breeding range as the Laurentian Mixed Forest and Eastern Broadleaf Forest Ecological Provinces of northern and eastern Minnesota. The map excluded all but the Minnesota River valley in western Minnesota. It also identified 21 counties where nesting had been confirmed since 1970. Only one record, in Brown County, occurred west of the forested regions. In 1998 Hertzel and Janssen published an updated map of nesting records confirmed since 1970. They deleted one of the counties identified by Janssen (Itasca) and added five new ones, including three in the Prairie Parklands: Blue Earth, Kandiyohi, and Nicollet. Barred Owl breeding season observations by the Minnesota Biological Survey added further evidence that the species’ breeding range is confined largely to the forested region of the state and along the Minnesota River valley into western Minnesota. Among a total of 73 records to date, only 7 were within the Prairie Parklands region (Minnesota Department of Natural Resources 2017). Long considered a non-migratory, sedentary species, the Barred Owl does undertake some movement in the winter months. Hatch (1892) believed birds in southern Minnesota moved further south during severe winters compared with northern birds. He occasionally received specimens from northern lumber camps during extremely severe winters, which led him to believe that northern populations were more sedentary than southern populations. Roberts (1932) made no mention of migratory movements, but Green and Janssen (1975) noted that winter influxes of birds occasionally occur, especially in northern Minnesota. Janssen (1987) specifically commented on the increased number of observations reported during the winters of 1983–1984 and 1984–1985, primarily in the southern half of the state, suggesting that the species may be “partially migratory.” In his comprehensive review of North American owls, Johnsgard (1988) also commented that the northernmost populations of Barred Owls “are probably semi-migratory, depending upon prey availability.” Whether or not these are truly migratory movements—with the birds returning the following spring—or one-time dispersals is unclear. During the MNBBA, observers tallied a total of 756 Barred Owl records distributed in 11.6% (558/4,794) of the atlas blocks that were surveyed and in 11.3% (264/2337) of the priority blocks. Breeding was confirmed in 59 blocks (Figures 2 and 3; Table 1). The birds were reported in 66 of Minnesota’s 87 counties and were confirmed breeding in 28 counties. Of these, 15 are additions to the map published by Hertzel and Janssen (1998): Carlton, Carver, Dakota, Dodge, Goodhue, Itasca, Lake, Lake of the Woods, Le Sueur, Lyon, Morrison, McLeod, Scott, Steele, and St. Louis. The overwhelming majority of blocks with Barred Owls were reported in the Laurentian Mixed Forest and the Eastern Broadleaf Forest Ecological Provinces. Overall, the species’ distribution is remarkably similar to what it was nearly one hundred years ago. Mazur and James (2000) note that the major change in the species’ North American distribution in the twentieth century was its expansion west into the boreal forests of Canada and the Pacific Northwest. Factors responsible for the movement were unclear but are believed to include fire suppression, increasing forest age, and the establishment of shelterbelts in the northern Prairie Provinces of Canada. Each of these changes would provide more suitable habitat for the Barred Owl. States and provinces in the Upper Midwest that have conducted two atlases also have found that the species’ distribution has remained largely unchanged over the years. The number of birds, however, have increased or decreased in response to habitat changes at the landscape level or as a consequence of more targeted owl surveys, such as in Ontario (Cadman et al. 2007; Iowa Ornithologists’ Union 2017; Chartier et al. 2013; Rodewald et al. 2016). Although the Barred Owl’s distribution in Minnesota appears unchanged, its relative abundance has changed significantly. In Roberts’s day, the Eastern Screech-Owl was considered the most abundant owl in the state. Today, the screech-owl is far outnumbered by both the Barred Owl and Great Horned Owl. The latter two species, nearly identical in abundance during the MNBBA, were nearly 12 times more common than the screech-owl. Breeding distribution of the Barred Owl in Minnesota based on the Breeding Bird Atlas (2009 – 2013). Summary statistics of observations by breeding status category for the Barred Owl in Minnesota based on all blocks (each 5 km x 5 km) surveyed during the Breeding Bird Atlas (2009-2013). Summary statistics for the Barred Owl observations by breeding status category for all blocks and priority blocks (each 5 km x 5 km) surveyed during the Minnesota Breeding Bird Atlas (2009-2013). Throughout its range, the Barred Owl can be found in mature forests and is often located near more open habitats used for foraging, such as forest clearings and wetlands. Both uplands and lowlands, particularly riparian woodlands, are used (Figure 4). Older stands are preferred and provide many structural features that are critical to the birds, such as large snags and decaying trees that provide nesting cavities. Dense canopies with persistent foliage (including both conifers and oaks) are ideal for daytime roosting and help provide protection from mobbing crows and from winter winds and cold temperatures. The understories of mature and old-growth stands are frequently more open, making foraging flights easier for this relatively large predator (Johnsgard 1988; Mazur and James 2000). Several ecological studies of the Barred Owl in Minnesota shed additional light on the species’ habitat preferences. Dunstan and Sample (1972) studied nesting pairs in Itasca County and found the birds preferred the interior of large forest tracts; fewer pairs were found in small woodlots or in young forest stands. Green (1995) actually classified the bird as an area-sensitive species in Minnesota. Detailed studies of its use of and reproductive success in forest stands of different sizes, however, have not been conducted (Danz et al. 2007). Johnson (1982), in his review of the status and distribution of all Minnesota raptors, remarked that although the Barred Owl is frequently found in a variety of uplands forests, including oaks, northern hardwoods, and mixed deciduous-coniferous stands, nesting most frequently occurred in bottomland hardwood forests. The most intensive, long-term studies on the Minnesota Barred Owl were conducted at the University of Minnesota’s Cedar Creek Ecosystem Science Reserve in Anoka and Isanti Counties in the 1970s. Demonstrating some of the earliest applications of radio telemetry in field ornithology, Nicholls and Warner (1972) examined habitat use, while Fuller (1979) analyzed how the Barred Owl, as well as three other raptors nesting on the Reserve, reduced interspecific competition. Both studies showed a strong habitat preference for oak uplands and mixed coniferous-deciduous forest uplands, using such sites more frequently than what would be predicted simply on the availability of the two habitats. In decreasing order of preference, other habitats used were white cedar wetlands, oak savannas, alder wetlands, marshes, and open fields (Nicholls and Warner 1972). The latter study found no major differences in use of the preferred habitats between males and females or by season. Typical breeding habitat of the Barred Owl in Minnesota (© Lee A. Pfannmuller). Data gathered by the federal Breeding Bird Survey (BBS) have been used to generate a continental population estimate of 3.2 million individuals (Rosenberg et al. 2016). A 2013 assessment projected that 1.6% of the continental population occurred in Minnesota (Partners in Flight Science Committee 2013); applying that estimate to the 2016 continental population estimate yields a statewide estimate of approximately 50,000 breeding adults. The Barred Owl is sparsely distributed throughout its breeding range (Figure 1), and densities of nesting pairs are usually quite low, usually less than one pair per km2 and often lower. A study in Michigan documented a nesting density of 0.03 pair/km2 (Craighead and Craighead 1956), a study in New Jersey reported a nesting density of 0.07 pair/km2 (Bosakowski et al. 1987), and a study in Maryland reported approximately one pair per km2 (Stewart and Robbins 1958). As for all raptors, the BBS is not a particularly effective tool for monitoring long-term population trends. The species’ nocturnal habits, coupled with its low abundance and early nesting phenology, result in trend lines that lack statistical precision at both the national and state level. With these cautions in mind, the BBS data demonstrated a significant increase at the national level, averaging 1.63% per year since 1966 and increasing at an even higher rate since 2005 (Sauer et al. 2017). The BBS data from Minnesota lack even more statistical precision than those at the national level but suggest the species may be increasing here as well. No state, province, or ecological region within the BBS survey area demonstrated a statistically significant population decline. To address some of the challenges in monitoring nocturnal raptors, the Hawk Ridge Bird Observatory collaborated with numerous conservation partners in Minnesota and Wisconsin to launch the Western Great Lakes Region Owl Survey in 2005. Conducted during the first two weeks of April and begun one-half hour after sunset, the survey utilized existing randomized routes established for other surveys. A total of 169 routes were located in Minnesota and 92 in Wisconsin. Volunteers were recruited each year to run as many routes as possible throughout the 2014 breeding season (Grosshuesch and Brady 2015). During the 10 years that the survey was in progress, results corroborate the increasing trends detected by the BBS (Figure 5). In 2015, the mean number of Barred Owls per route was 0.77; indeed it was the most frequently encountered owl in the state, followed by the Great Horned Owl and Northern Saw-whet Owl. But the abundance of Barred Owls may have been influenced by the timing of the surveys. Early April coincides with the peak of the Barred Owl breeding season, whereas the Great Horned Owl and the Northern Saw-whet Owl breed earlier in the year. Figure 6 illustrates the distribution and abundance of the Barred Owl along the survey routes in 2014. Specific factors responsible for the apparent wide-scale increase have not been closely examined. By and large, areas where forests have matured, such as New England, provide increased habitat opportunities. On the other hand, it is generally acknowledged that the Barred Owl has declined in regions where large tracts of mature and old-growth forest have disappeared, such as in portions of the eastern and southern United States (Johnsgard 1988). The latter may be offset by the expansion of the species’ range into western Canada and the Pacific Northwest during the twentieth century (Johnsgard 1988; Mazur and James 2000). 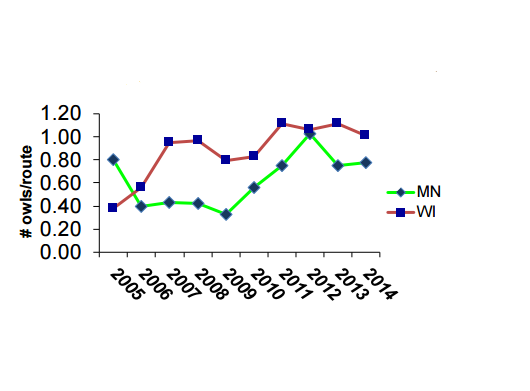 Mean number of Barred Owls per route for Minnesota and Wisconsin, as detected in the Western Great Lakes Owl Monitoring program (Grosshuesch and Brady 2015). Distribution and abundance of Barred Owls in Minnesota and Wisconsin in 2014 (Grosshuesch and Brady 2015). Widely distributed throughout the eastern United States and western Canada, with increasing populations, the Barred Owl has been assigned a low continental conservation score of 7/20 (Rosenberg et al. 2016). It is not considered a conservation priority at either the state or federal level. Although persecuted for many years by farmers and sportsmen alike, shooting is no longer a major source of mortality. As a species dependent on mature forests, the loss of habitat is a primary concern for sustaining populations. A recent study in Minnesota’s upper Mississippi River watershed documented that nearly 400 square miles of forest, wetlands, and grasslands were lost from 2010 to 2014. This represents the second-fastest rate of land conversion in the country (Marcotty 2016), impacting countless species dependent on the watershed’s resources, including the Barred Owl. In areas of the state where extensive forest habitat remains, management practices that increase rotation ages and emphasize the maintenance of snags and decaying trees are critical. Such practices are particularly important on county, state, and federal lands. A warming climate is increasingly considered a challenge for many species. Although the Barred Owl’s vulnerability has not been closely examined, a 2010 report by the North American Bird Conservation Initiative assigned it an initial vulnerability ranking of “low.” Warming temperatures, however, are predicted to result in numerous changes to North American forests, including changes in tree species composition and forest disturbance regimes. Ultimately, the distribution of many forest birds is predicted to shift northward in response to these and other associated changes (North American Bird Conservation Initiative, U.S. Committee 2010). Largely considered a beneficial species with a secure future in Minnesota, conservationists have an entirely different view of the species in the Pacific Northwest, where the owl has expanded its range and increased in abundance in recent years. After decades of intensive conservation efforts to protect and restore the Spotted Owl’s old-growth forest habitat, the larger and more aggressive Barred Owl is now considered the greatest threat to the future of this federally threatened species (Welch 2009). Bosakowski, Thomas, Robert Speiser, and John Benzinger. 1987. "Distribution, Density, and Habitat Relationships of the Barred Owl in Northern New Jersey." In Biology and Conservation of Northern Forest Owls: Symposium Proceedings, February 3–7, Winnipeg, Manitoba, edited by Robert W. Nero, Richard J. Clark, Richard J. Knapton, and Robert H. Hamre, 135–143. General Technical Report RM-142. Fort Collins, CO: USDA Forest Service, Rocky Mountain Forest and Range Experiment Station. Craighead, John J., and Frank C. Craighead Jr. 1956. Hawks, Owls and Wildlife. Harrisburg, PA: Stackpole Company. Dunstan, Thomas C., and Steve D. Sample. 1972. “Biology of Barred Owls in Minnesota.” Loon 44: 111–115. Nicholls, Thomas H., and Dwain W. Warner. 1972. “Barred Owl Habitat Use as Determined by Radiotelemetry.” Journal of Wildlife Management 36: 213–224. Stewart, Robert E., and Chandler S. Robbins. 1958. Birds of Maryland and the District of Columbia. North American Fauna, no. 62. Washington, DC: U.S. Department of the Interior, Fish and Wildlife Service.